To print the forms you will need Adobe Acrobat. to download it for free to your computer. 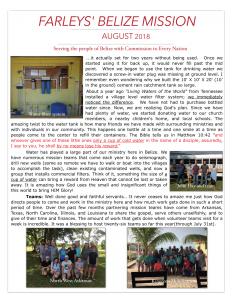 What is the cost while we are in Belize? Our rates for each team member are $60.00 U.S. per day/per person. This includes drinking water/ice cooler and drinks (which comes with the bus fee), pickup at the airport in Belize City for the same price as getting the team around in Toledo District, three meals per day and housing. The break down is $20.00 for meals, $20.00 for transportation and $20.00 for housing per person/day. Can you suggest a good fun day trip? The tour guide company we use in Placencia is “Night Winds Tours.” They do not have a web site and a credit card can be used but they have to take the card to another business to be swiped and it takes a long time to get it done. Credit card is not impossible to use in some of these places but cash is best. Belizeans like U.S. currency so there is no need to exchange because it is worth more (and more stable) than their own money. The only thing that does not spend here in Belize are U.S. coins. The all day Silk Caye tour is (5) hours long and costs $60.00 U.S. The tour starts at 9:00 A.M. and concludes at 2:00 P.M. All snorkel gear is provided, the boat to transport people to a caye as well as lunch. After lunch there is another hour and a half of snorkeling. This tour usually takes the diver to nurse sharks, turtles and rays on the final leg of the excursion. The do not have an email account so phone is the only way to communicate with them. Their number is (011.501.660.6333). The half day tour is from 9:00 A.M. to 12:00 it is snorkeling only. This excursion is for $40.00 U.S. All gear is provided along with water, juice and fruit in an ice cooler. The Monkey river tour is another guided tour which requires a short boat ride and a short hike into the jungle to see howler monkeys. I have been told they come right up to the tour and make alot of noise. I have heard alot of good comments about this tour. The price for this tour is $55.00 plus a lunch is provided for a small fee of $7.00 at a place you will stop. There will be water, juice and fruit provided in an ice cooler. Do we need tools for work projects or will those be provided? All of the tools will be provided but if you would want to donate towards some of the building materials for a project would be welcomed. If not we will still have some work to get done. Is there a way VBS works best in Belize? If school is out we may get the village children together and have a conventional VBS where all the kids are in one large room. The only reason we break up and go into class rooms is because school in Belize is in session for ten months out of the year. September 5th through the end of June. What will we be doing for school assemblies? The afternoon school assembly works well. It is just one hour in length and a different school every evening or when we do this type of ministry. The session starts with a few songs and something to get the crowd involved. One speaker will give the gospel message and give an invitation. As the session ends the whole group ministers to the school at the end just before we leave. At the end is a good time to do balloons, bracelets or something easy to give out. Do we need to bring extra money for the days we eat out? Yes, I normally encourage teams to bring an additional $100.00 + for personal spending. You will need extra money for the snorkel excursions ($60.00 U.S. for a full day tour) and if you could pay for the meal on the road leaving the airport on the first day, the noon meal at Placencia and the noon meal on our return to the airport would help alot. We will subtract three meals from what you will owe the center for meals. Every other meal should be paid for by the group funds you send to us. Is there a dress code/ recommendations? We ask teams to wear conservative clothing (knee length shorts or capris, no tube tops, halter tops, or spaghetti straps). For church services we would ask that the team wear pants, long skirts or dresses (knee-length) and shirts with shoulders and backs covered. While around the center or swimming, casual (but modest) works very well. Remember: when it is rainy season here, have the group wear appropriate shoes for water and mud, bring a rain poncho or umbrellas, and a cap or hat for the sun when it is out. The best insect repellant is deet. I would recommend each team member bring a small flashlight as well as personal snacks for in between meals. Each team member will need to bring his/her own towels and a set of twin sheets. Can you tell me what a typical week of ministry would look like? Customs and Immigration will take approximately one hour to get the team through. Depart from air port to drive south to PG. Continue traveling to Punta Gorda, Toledo District. 4 hours drive with one rest room break in the middle of the trip. Arrive at the Training Center 9.5 miles north of Punta Gorda, on the Southern Highway. 3:00 visit homes in village. rest of the afternoon at Blanco Falls swimming.